Achieving a degree in hospital administration isn’t easy, but at the end of that long and hard road, it’s time to truly decide which hospital administration career path you would like to take (assuming you haven’t already chosen your specialization). Here are the most common career paths that hospital administration degree holders jump into, including their roles, duties, requirements, and salaries. With this information, it’s time for you to decide on your future for yourself. 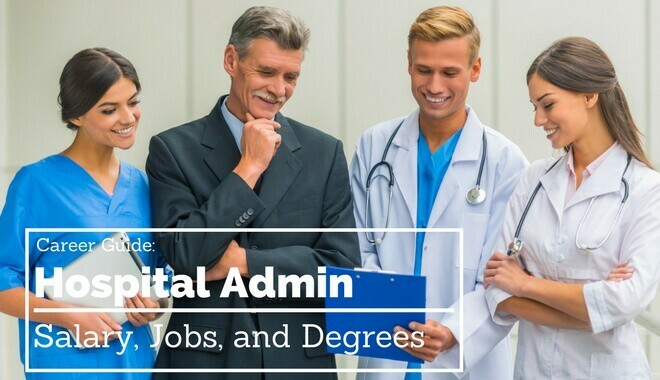 A hospital administrator is the general term for professionals who take up administrator positions in a medical facility or a related healthcare organization or office. They deal with the larger decisions that influence the healthcare process and system, viewing healthcare as a unified machine that must be fitted to operate at optimal performance. Like most careers in the healthcare industry, it is essential that any applicant holds a bachelor’s degree. However, most top hospital administrators carry a graduate degree in Business Administration, Public Administration, or Health Administration. These graduate programs are preferred due to their proven track record of imbuing students with skills expected of a hospital administrator, including budget development, staff administration, and various advanced business skills. Licensure is almost never required to become a hospital administrator. To improve your credentials beyond your undergraduate or graduate degree, you can become a member of the ACHE, or the American College of Healthcare Executives. According to PayScale in September 2017, the average salary of a healthcare administrator in the US was $88,000, however the range widely varied, depending largely on the person’s experience, location, and unique duties of the position in the respective organization. The lowest earners made $46,000, while the highest made $175,000. It is first important to note that a nurse administrator and a nurse manager are two unique roles, accounting for a large difference in responsibilities, duties, salaries, and expectations. While a nurse manager is typically expected to manage over a single or several nursing units in a medical facility or healthcare organization, a nurse administrator manages over several departments, sometimes even several hospitals or organizations. They are viewed as the link between the “soft skills” nursing department with the business side of an organization, reporting directly to the CEO or Vice President. They are also sometimes known as the director of nurses, vice president of nursing, or a nurse executive. Like most if not all professions related to healthcare, a nurse administrator is required to hold a bachelor’s degree, though it is recommended to hold a master’s degree or higher. Preference is given to those who have accomplished a Master of Science in Nursing program concentrated in nurse administration. For further qualifications, an aspirant nurse administrator may take a post-master’s certificate targeted towards registered nurses specializing in nursing administration. These certificates include courses on nursing research, health planning, and health policy, alongside business skills involved in management and finance. It is mandatory to have licensing as a registered nurse for all nurse administrators. Specific licenses for nurse administration is only required of nurse administrators employed by nursing care facilities, in all states in the US. Potential nurse administrators are also encouraged to achieve the American Nurse Credentialing Center certification. This is the highest standard that a nurse administrator can achieve, proving a respectable level of knowledge and understanding with nurse administration, allowing holders to demand higher salaries. According to PayScale in September 2017, the median salary of a nurse administrator is $82,700, with the lowest earners making $59,000 and the highest earnings making $122,000. Most nurse administrators are granted medical benefits, with over half with dental insurance. What Is a Healthcare Accounting and Financial Manager? A healthcare accounting and financial manager can be thought of as an accounting and financial manager with a specialization in the healthcare industry. Unlike other administrative positions in the healthcare industry, a healthcare accounting and financial manager requires little to no actual education or experience directly working with the well-being and treatment of patients. However, financial managers with experience managing the unique finances of healthcare facilities and organizations are definitely preferred. Simply put, the healthcare account and financial manager is responsible for maintaining and improving an organization’s financial health. As healthcare accounting and financial managers typically require no healthcare experience, the requirements are less stringent than other administrative positions. Typically, a successful financial manager candidate possesses a bachelor’s degree and at least five years of experience in finance and accounting, working as a financial analyst, securities sales agent, auditor, or accountant. The strongest candidates for this position would have some internship or entry-level experience in the healthcare industry, though this is definitely not required. According to PayScale in September 2017, the median salary of a financial manager is $70,640. The lowest earning financial manager makes $40,000, and the highest earning financial manager pulls in $116,000. A financial manager working in a large healthcare organization would typically earn more than the median. Medical and health services manager are some of the highest-ranking administrators in any healthcare facility or organization. They are in charge of administering, planning, coordinating, and directly the medical and health services of a specific department or team, or an entire organization. Medical and health services managers are also responsible for ensuring that regulation compliance is maintained. A medical and health services manager has a wide variety of duties, and is generally considered the administrator to approach for all unique matters, regardless of department. While only a bachelor’s degree is required of a medical and health services manager, master’s degrees are definitely preferred, and are actually common amongst medical and health services managers. These degrees should be relevant to health management, nursing, health administration, business administration, or public health administration. Healthcare and management degrees are typically viewed as the best for this field, as they teach both medical skills and business skills. As for licenses, all nursing home administrators are required to have licensure. For other administrator positions, most states require that the applicant passes a state-approved training program and the national licensing exam. Stricter states require another state-specific exam, with test-takers required to have some experience working in the healthcare industry. According to PayScale in September 2017, the median salary of a medical and health services manager is $63,800. The lowest-earning medical and health services managers are paid $40,000, while the highest-earning managers receive $91,000. What Is a Health Information Management Manager? A health information management manager is in charge of the health information systems of a healthcare facility or organization. This manager understands the unique situation and operations of the facility or organization and designs and oversees health information systems that properly complement its setting. This means collecting and analyzing the patient data that doctors and nurses use for their jobs, and using this patient data in a way to improve system efficiency. Through your meticulous understanding of the data going through the facility, you can improve the quality of healthcare services. A health information management manager typically finds himself focused on adapting the health information systems of a facility or organization and ensuring that they are compliant with the ethical, legal, and medical regulations. As usual, a bachelor’s degree in a field related to healthcare or medical technology is required, while a master’s degree is only preferred. After you have earned your bachelor’s degree, you are required to achieve the RHIT or Registered Health Information Technician credential. Afterwards, you must be an earner of the Registered Health Information Administrator certification, awarded by the American Health Information Management Association. It is here that background with a master’s program will benefit you, as these programs usually prepare you for the general management training that will be tested during the RHIA certification exam. According to PayScale in September 2017, the median salary of a health information management manager is $54,500. The lowest-earning health information management managers are paid $35,000, while the highest-earning health information management managers are paid $81,000. What Is a Physician Executive? A physician executive is a physician who has upgraded his skills to go beyond healthcare and patient treatment and understands the ins and outs of the medical world enough (and his or her smaller medical community) to lead decisions for the organization. The physician executive is an interesting career path. After becoming a certified physician, and after having practiced it for several years or decades, only then can you consider becoming a physician executive. To make this final jump, you must complete the Certifying Commission in Medical Management certification program, which takes three and a half days. After passing this program, a physician can be classified as a certified physician executive, or a CPE. According to PayScale in September 2017, the median salary of a physician executive is $210,000. The lowest-earning physician executives are paid $146,000, while the highest-earning physician executives are paid $271,000. Regardless of the career path you choose to take with your hospital administration degree, it is clear that your pursuit of this field is genuine, since you’ve made it this far. Truly understand the path you want to take and start pursuing that path today.